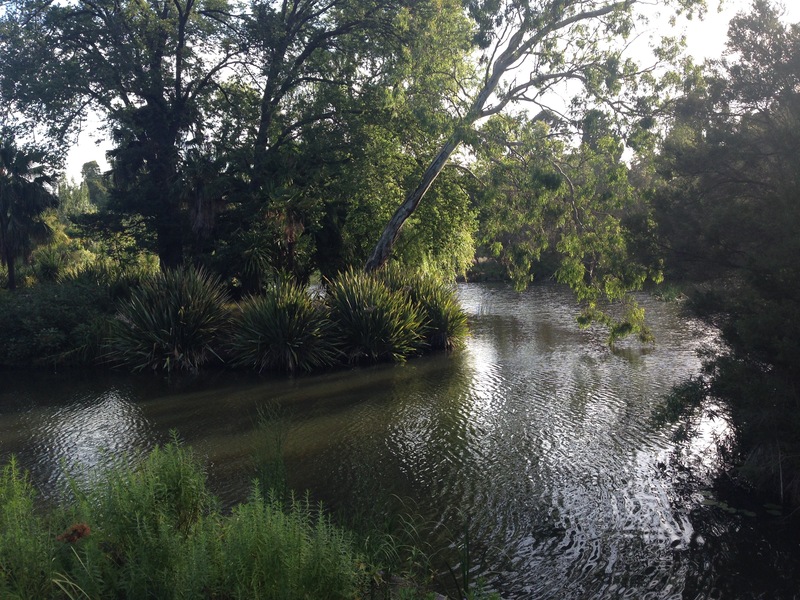 You could be forgiven for thinking this was the Murray River, meandering its way through rural Australia. But no, it is inner city Melbourne. The Botanic Gardens, no less. 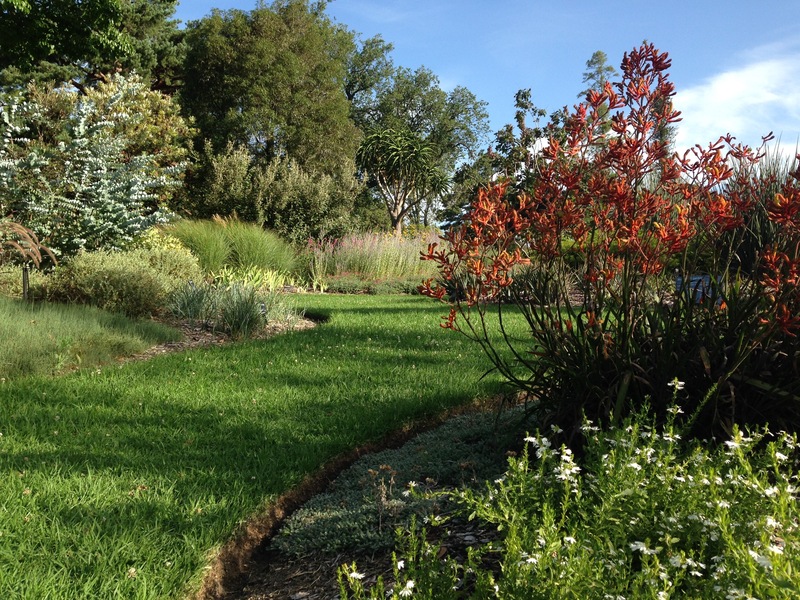 These gardens span 38 hectares, quite something when they are only two kilometres from the CBD, and are home to over 10,000 different plant species. I have walked through the gardens many, many times, but each time feels like a unique experience. 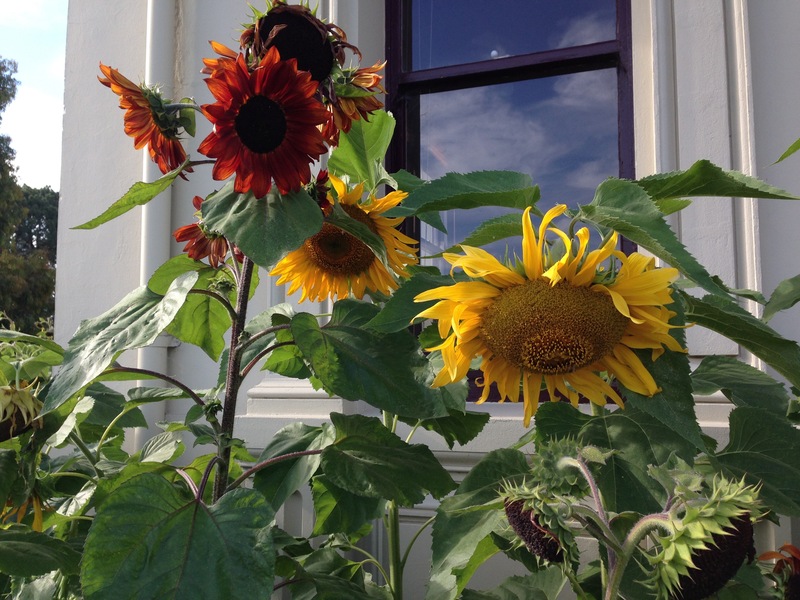 Sunflowers at the entrance to the gardens. I had been somewhat thrown by the subsequent, singularly dotted sunflowers throughout the garden (thought the curators had had an ‘off’ day throwing seed around), until I learnt they were part of the kids ‘Fairy Trail’! A new garden has been planted since I was last there, funded by a keen supporter of the gardens, Meg Bentley. I loved it! Its soft colours blend together perfectly. There are wonderful contrasts of textures and forms. 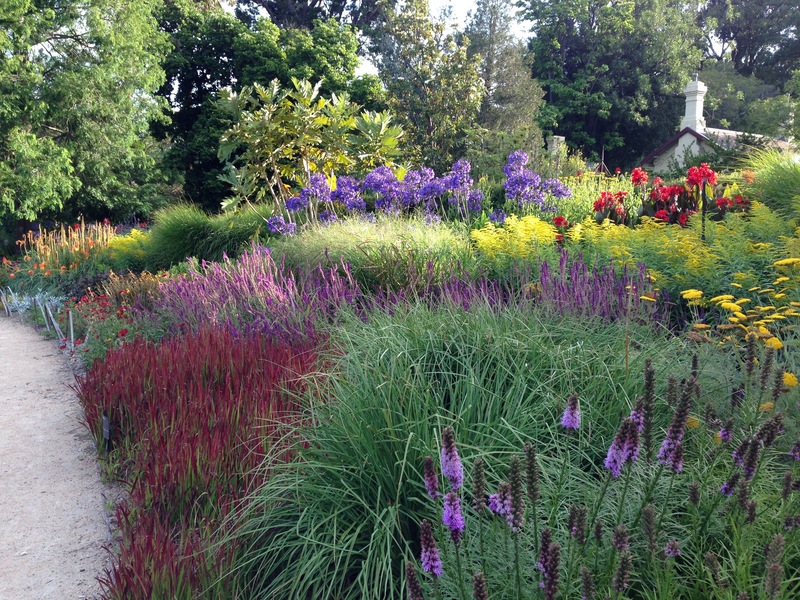 Each species is planted in large (but not boringly large) drifts and each is ultra drought tolerant. This is gardening inspiration exactly as it should be. The adjacent bed is brought to life with fiery oranges and citrus tones. 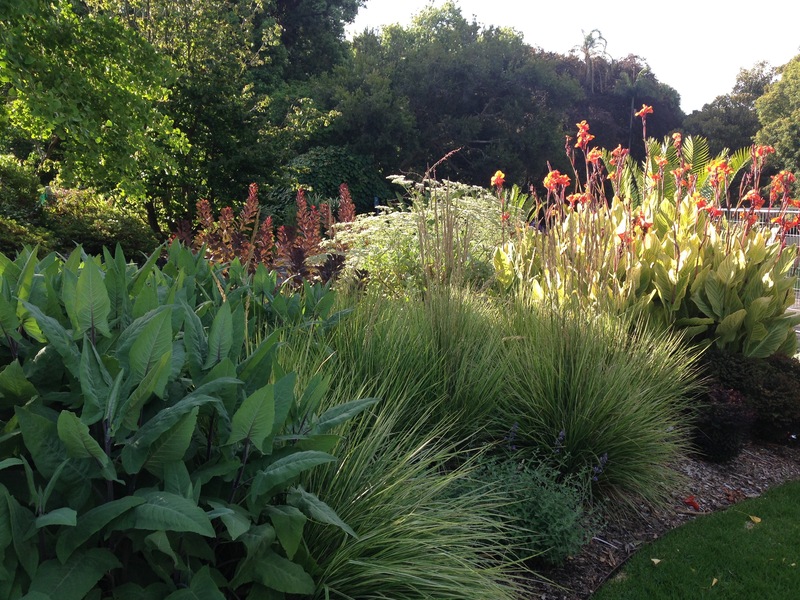 Solid, generous planting with the same, highly contrasting textures and forms and complementary colours; plants chosen for their hardiness to all the weather Melbourne can bring. These bold, contrasting schemes are right up to date and tremendous to see. 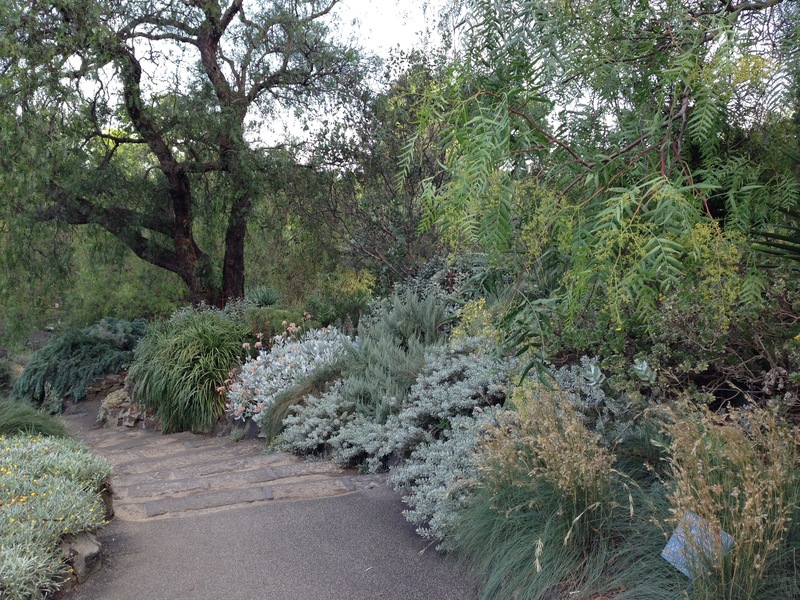 Contemporary planting continues in the Australian areas with Kangaroo Paws (Anigozanthos) and some unusual eucalypts. In time, I would love to see a little more in the Australian style. There are also the more traditional areas, and I do enjoy the mix. The perennial garden is always a joy at this time of year – bursting with bright colours and looking so full and so fresh. The plants have been chosen to provide six to eight months of flowers and it is really quite a spectacle. When supposedly clashing colours don’t quite clash, the result is tremendous! 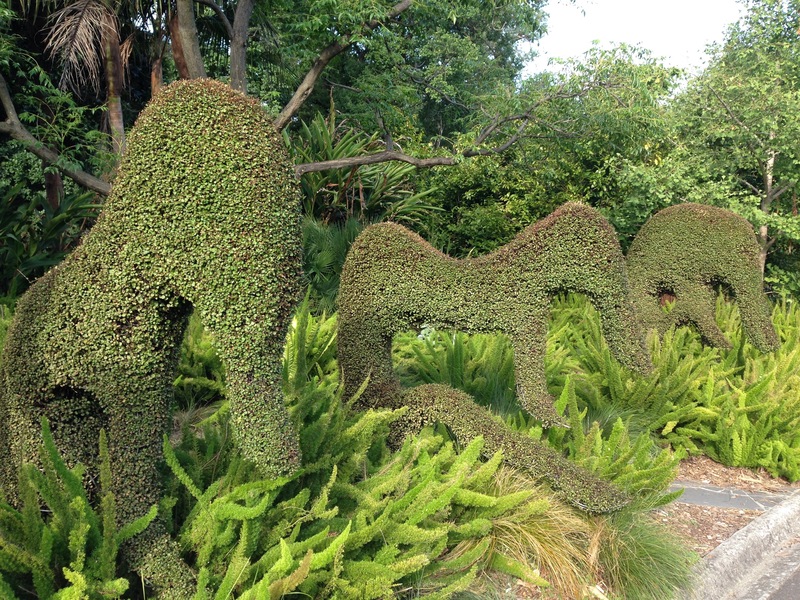 The topiary is also fun; lovely curving shapes, immaculately pruned (I dread to think how often), created with the fast growing Lonicera nitida. The grey garden was also something I hadn’t seen before, located right up in the far northern corner of the gardens. I admit that I did find myself desperately searching for a hint of yellow or pink or just something that wasn’t grey, but it was certainly ethereal in the fading light of the day. 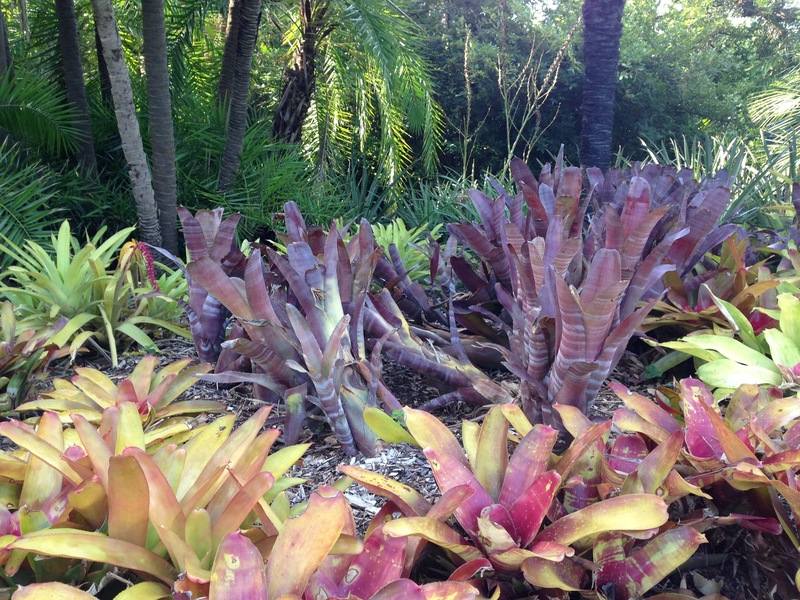 But in this garden of contrasts, there are always the bromeliads to cheer you up! It is incredible the variety of plant types displayed; there genuinely is something for everyone. The huge Ornamental Lake in the gardens adds so much to the peaceful, restful ambience. Much of it was closed off for the outdoor cinema when we were there, but the ducks came to see us, nevertheless! 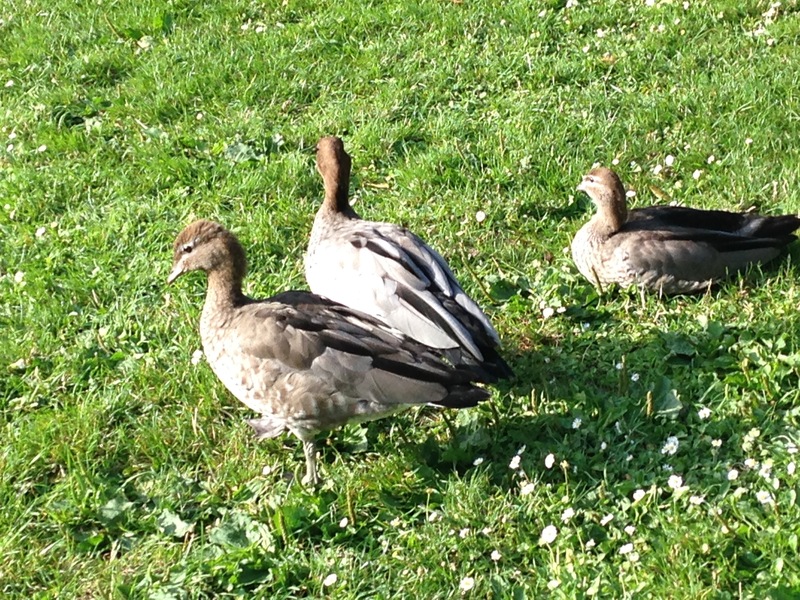 Ducks visiting from the Ornamental Lake! It turned out the cinema was a blessing in disguise, as it meant we explored new areas. There is just so much to see. 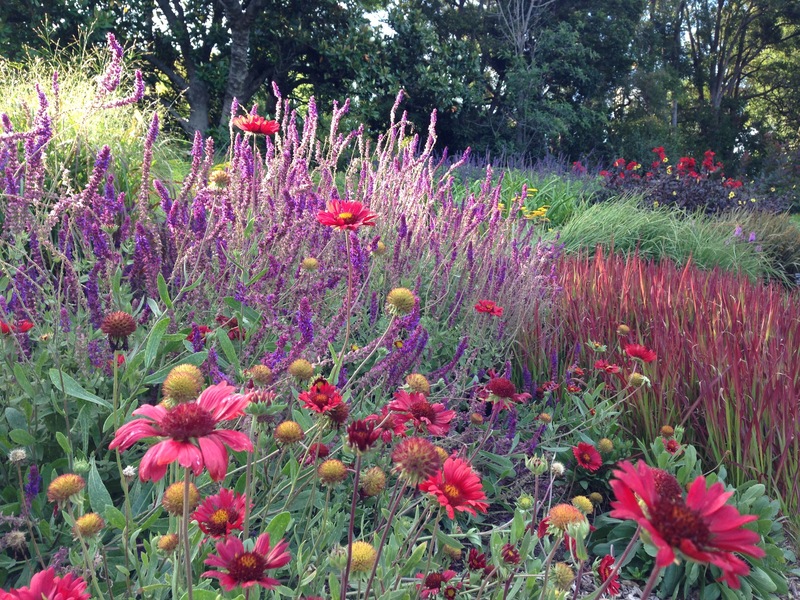 I love the fact that these gardens are a real celebration of all things plants. It isn’t about flashy hard landscaping, which you can see in spades closeby in the city, it is about getting back to nature, exploring soft, beautiful scenes of new and old and leaving the cares of the world behind you. A truly wonderful place to be revisited over and over again; one that you can never tire of. 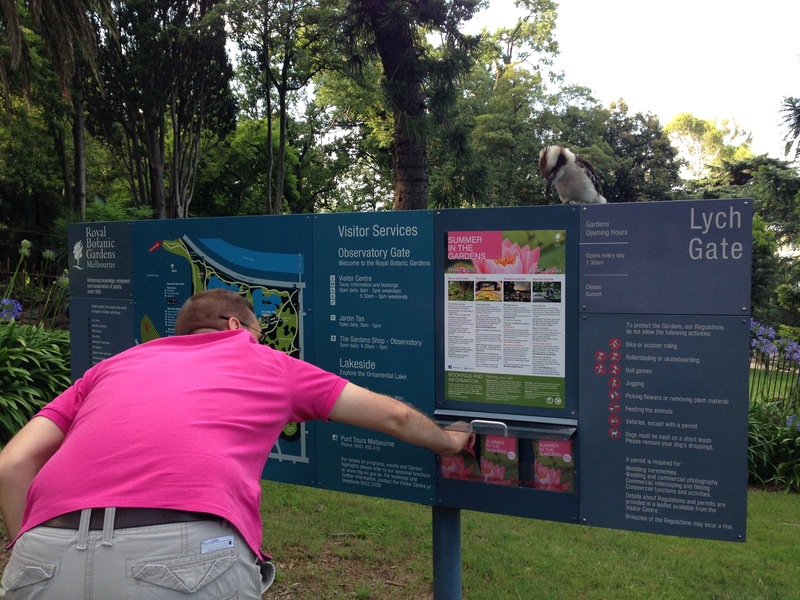 Kookaburra guarding the maps – I had to send Paul in for me; its beak was way too large and sharp. Good job he had his best camouflage on that day! Wow – Is all I can say Janna. I haven’t been since I used to take students there – the last visit was about 15 years ago. Must go again. Another excursion once Ian retires. Brave Paul – perhaps the kooka was blinded by the brilliance! Gosh, I can’t believe you haven’t been there for 15 years! Definitely for the list. Yep, you’ve put it back my Melbourne to-do list as well. I had no idea there was a grey garden. I think there are also new additions to the Children’s Garden to see. I’m glad – it is nice that great places have lots of visitors. The grey garden is quite sizeable – it really surprised me too. And yes, there were huge volumes of noise coming from the children’s garden, although I confess that I didn’t go in. Do let us know what you think! Looks super, and lovely photos as usual Janna. 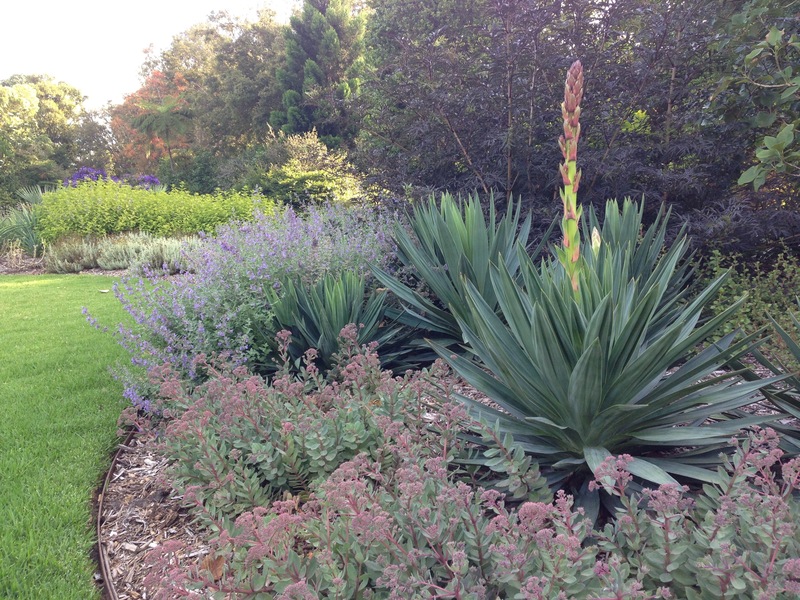 Good to see all those perennial borders – lucky Melbourne gardeners can go and see how to put one together! Says Mrs Amazing Perennial Border of Wellington! So pleased you enjoyed them. I am sure you will return the favour in June.